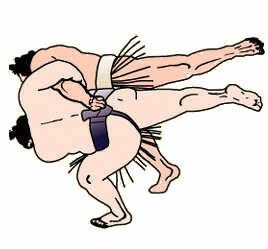 Un combat de 7 secondes a peut-être décidé du sort de Kisenosato, qui a subi sa troisième défaite consécutive ce mardi. Dans l’avant-dernier combat, Kisenosato a été rapidement vaincu par Tochiozan (1-2). 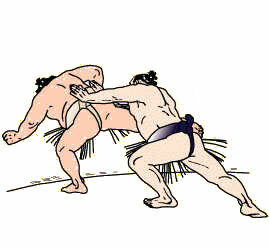 Le yokozuna japonais a tenté de projeter son adversaire, mais s’est retrouvé au bord de la paille alors que Tochiozan le faisait pivoter. Cette défaite était la huitième consécutive pour Kisenosato depuis septembre, ce qui en fait le pire yokozuna depuis 1949, date où le système des tournois sur 15 jours est entré en vigueur. S’il concourt mercredi, Kisenosato affrontera Nishikigi pour la première fois. La majorité des champions ont été malmenés lors de cette troisième journée, Kisenosato bien sûr, mais aussi Kakuryu qui a subi sa deuxième défaite consécutive. Kakuryu a été repoussé par Nishikigi (3-0), et si les deux lutteurs semblaient être tombés en même temps du dohyô, les juges ont attribué la victoire au maegashira 2. Hakuho a arraché sa troisième victoire contre Ichinojo (2-1). Le yokozuna a été emmené au bord par son compatriote, mais il a tourné au centre pour retrouver son élan. Le grand champion mongol avait essayé de repousser son adversaire de 226 kilos mais Ichinojo a tenu bon. 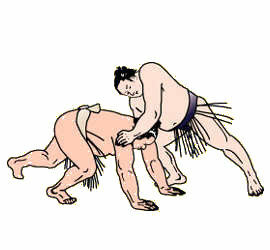 Alors que les deux lutteurs étaient fatigués, Hakuho a montré sa technique et a envoyé Ichinojo à terre. Comme lors de la première journée, les trois ôzeki ont été vaincus. Takayasu (1-2), qui était grippé avant le tournoi, a fait un bon départ contre Hokutofuji (3-0), mais a été renversé par le maegashira 2. 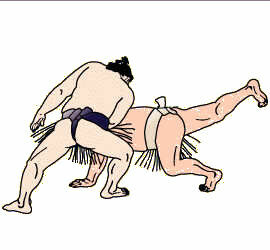 Donnant peu de marge de manœuvre, Hokutofuji s’est approché de l’ôzeki et l’a forcé à quitter le dohyo pour conserver son score parfait. Mitakeumi reste également invaincu après avoir éliminé Goeido qui reste sans victoire. 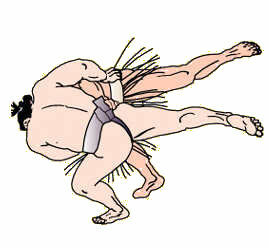 Myogiryu a obtenu sa première victoire de la compétition après avoir battu l’ôzeki Tochinoshin, qui, comme Goeido, a subi sa troisième défaite consécutive. Le Géorgien semblait prêt à rebondir après deux défaites mais a été tenu à distance par le komusubi. Takakeisho a remporté son affrontement contre le sekiwake Tamawashi (2-1) est reste lui aussi invaincu. Quatre autres lutteurs sont également invaincus après trois jours d’action : Aoiyama, Onosho, Kaisei et Chiyonokuni. 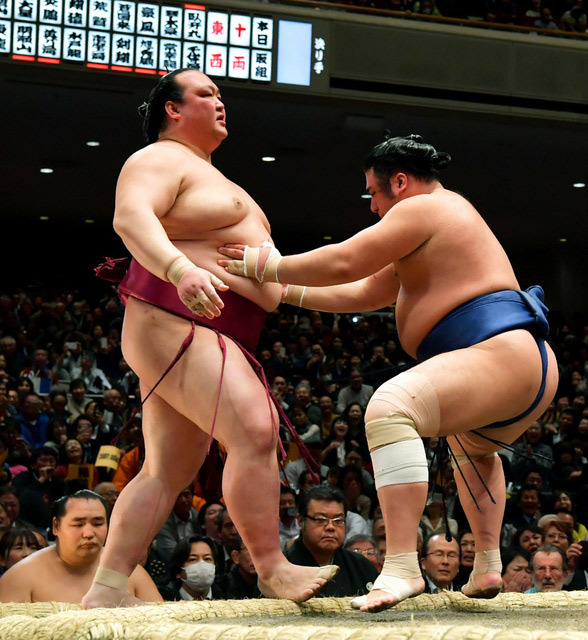 A 7-second bout may have decided the fate of grand champion Kisenosato, who suffered his third straight loss of the New Year Grand Sumo Tournament on Tuesday. 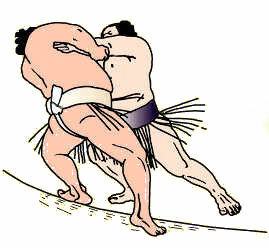 In the penultimate bout at Tokyo’s Ryogoku Kokugikan, Kisenosato was quickly dispatched by Tochiozan (1-2) despite going into the match holding a 26-16 record over the top-ranked maegashira. 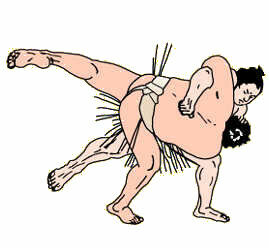 The 32-year-old Japanese yokozuna attempted an overarm throw against his opponent, but instead found himself at the edge of the straw as Tochiozan swung Kisenosato around and nudged him out. The loss was Kisenosato’s eighth straight since September, not counting his forfeit on Day 5 of November’s Kyushu tourney, making it the worst run for a yokozuna since the 15-day grand tournament format began in the summer of 1949. If he competes on Wednesday, Kisenosato will face No. 2 Nishikigi for the first time in the top division. 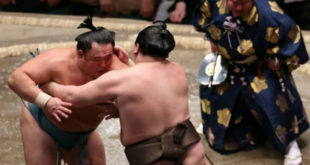 The majority of the sport’s elites were upset on Day 3, including Kisenosato’s fellow grand champion Kakuryu, who suffered his second straight loss. 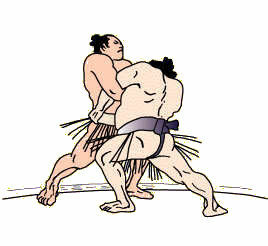 Kakuryu was quickly driven back by Nishikigi (3-0), with the rank-and-filer coming out on top in a judgement as both wrestlers appeared to fall out of the ring at the same time. 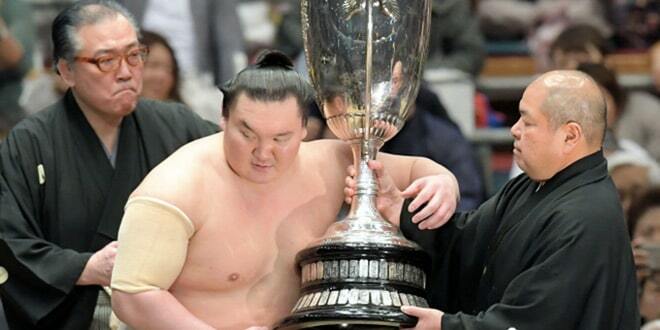 Hakuho, however, earned his third straight win with a hard-fought victory against No. 1 Ichinojo (2-1). The yokozuna was taken to the edge by his compatriot after their initial clash, but circled around to the center of the ring to regain his momentum. The Mongolian grand champion, who holds a record 41 top division titles, tried to muscle his 226-kilogram opponent over the straw but Ichinojo held fast. 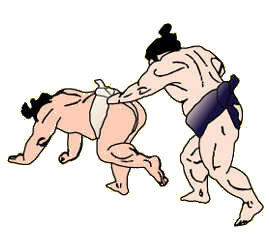 With both wrestlers tiring out, Hakuho showed off his trademark technique and steered Ichinojo out. As on opening day, all three ozeki took losses from their lower-ranked opponents on Day 3. 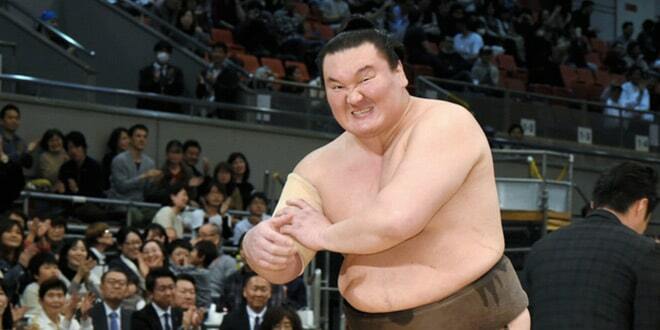 Takayasu (1-2), who had the flu prior to the tournament, got off to a solid start in his bout against Hokutofuji (3-0), but was turned around when he was momentarily yanked down by the No. 2 maegashira. Giving little room to maneuver, Hokutofuji closed in on the ozeki and forced him out of the ring to keep a spotless record. Mitakeumi also remains undefeated after taking down Goeido, who is off to a 0-3 start after withdrawing early at the Kyushu meet in November. The komusubi, hoping to bounce back after being demoted after going 7-8 in November, put Goeido on the back foot from the outset, and flipped the ozeki onto his side when Goeido tried to mount a counterattack. Myogiryu got his first win of the meet after defeating ozeki Tochinoshin, who like Goeido suffered his third straight loss. The Georgian looked prime to bounce back from two opening losses, but was stood upright by the komusubi and pushed out. In Tuesday’s first upper-ranked bout, Takakeisho won a sekiwake clash with Tamawashi (2-1) to remain undefeated and hand the Mongolian his first loss of the tournament. With both wrestlers competing at the sport’s third highest rank for the first time in their careers, Takakeisho got the better of the initial charge and drove Tamawashi towards the edge of the ring before his opponent rebounded with a powerful return shove. 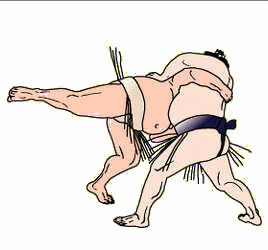 Standing 175 centimeters tall, 13-cm less than his opponent, Takakeisho dug in and delivered a flurry of low thrusts that sent Tamawashi over the straw. Takakeisho faces Mitakeumi on Day 4 in his quest for a second straight top division title. Four other lower-ranked wrestlers remain undefeated after three days of action, including No. 5 Aoiyama, No. 6 Onosho, No. 8 Kaisei and No. 15 Chiyonokuni. 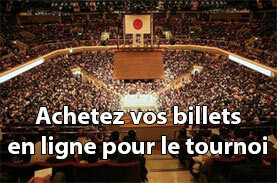 Les trois Ozeki cumulent un 1-8 ! 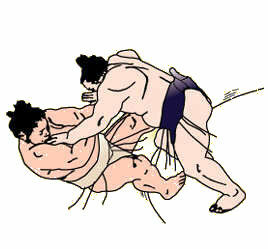 Kisenosato est plus qu’au crépuscule de sa carrière, le statut de Yokozuna était trop lourd pour lui, Intai pour demain ? 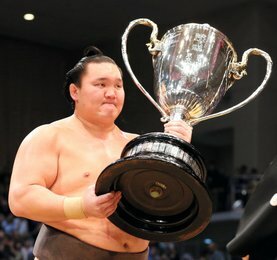 Seul Hakuho reste encore et toujours tout en haut ! Sinon Takakeisho est sur une lancée impressionnante, il a remporté 22 de ses 24 derniers affrontements !